Tag line: "Fly in the cockpit of some of history's most amazing aircraft"
Directed by Stephen Low (Titanica, Mark Twain’s America), 2010’s Legends of Flight is an IMAX movie that centers on aviation, from its rich and storied past to the modern advancements that are revolutionizing the aircraft industry. With Mike Carriker, the chief test pilot for Boeing, as our guide, we see classic planes like the Harrier Jet and the Schleicher Glider in action, and take a trip inside a Boeing assembly plant, where the company’s latest and greatest, the 787, is being tested and re-tested to ensure that it’s safe. 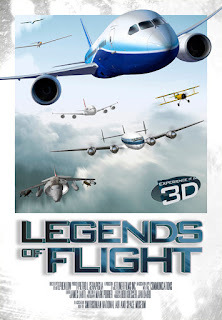 Yet while the various sequences detailing the history and construction of aircrafts are, indeed, interesting, it’s the manner in which director Low presents it all that makes Legends of Flight such an engaging film. Relying heavily on computer graphics, it recreates the legendary Constellation (a style of plane originally used by the military during World War II, the Constellation became a commercial craft in the mid-40s, when TWA introduced it to the world), and employs a variety of graphics that enhance those sections delving into airplane design, carbon fibers (used for the first time, supposedly, in the Boeing 787), and other topics that, without the CG, would have seemed a bit too scholarly for their own good. That said, Legends of Flight does, on occasion, come across as one big commercial for Boeing Industries (we spend a great deal of time watching its employees build what they hope will be a new and improved style of plane). While we do occasionally catch a glimpse of a competitor’s aircraft (including the Airbus A380, an amazingly large machine that can seat as many as 580 people), Boeing is clearly the star of this particular show. 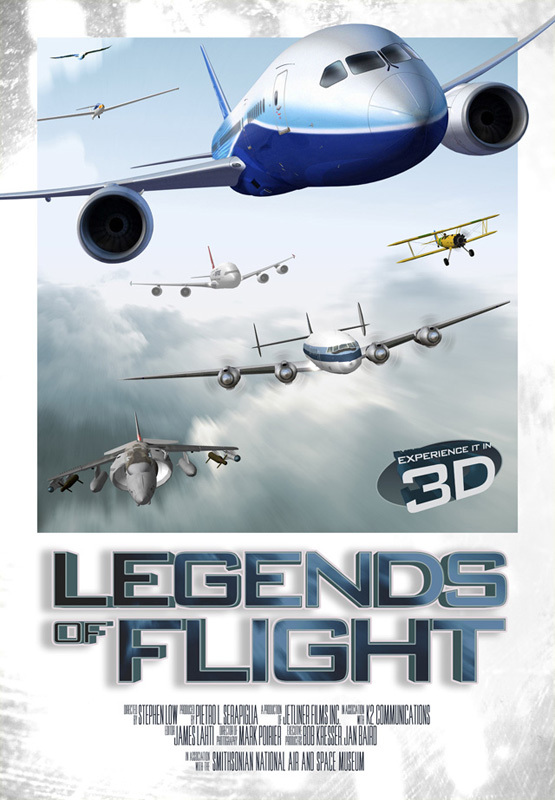 No matter, though, because even without the Boeing material, Legends of Flight would be an informative, occasionally exciting motion picture experience.